By now, you've probably heard that Mike Matusow won a $100,000 weight loss bet with Ted Forrest. What you may not know is how this bet came to be, and how close Matusow came to losing the bet. The origins of the bet can be traced back to the 2007 World Series of Poker. It was no secret that Matusow was packing on the pounds - he seemingly weighed more with every passing tournament. This fact was not lost on others, who usually took every opportunity that they could to razz Matusow about his ever-expanding waistline. At the time, Matusow weighed about 241 pounds, according to an article that was recently published in the New York Times. During a 2007 WSOP tournament, Matusow casually mentioned that he used to weigh 181 pounds. Somebody mentioned that there was no way Matusow would ever weigh that again, especially considering the fact that he seemed to gain more weight every month. Ted Forrest and Matusow quickly agreed on a bet - if Matusow could get down to 181 pounds by the beginning of the 2008 World Series of Poker (June 3rd, 2008 to be exact), then Forrest would pay Matusow $100,000 (actually $60,000, as Matusow already apparently owed Forrest $40,000). The bet was on. Matusow started shedding pounds, and appeared noticeably thinner throughout the year. He was running, he was eating better, and he was spending time in the sauna. 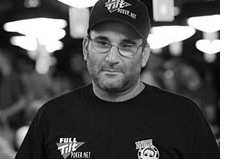 As the 2008 World Series of Poker drew closer, Matusow appeared to be headed for a sure victory. He only needed to drop eight pounds in 19 days to win the bet - a drop in the bucket for a 6'0 man who needs to drop weight in a short period of time, especially with six figures on the line. However, Matusow was soon going on a cruise with his girlfriend, and wanted to enjoy himself. The NY Times article (link below) goes on to say that Matusow asked Forrest to settle the bet for $70,000, so that Matusow could enjoy himself on the cruise. Forrest, surely seeing an opportunity for Matusow to pack on the pounds and miss making weight, said no. I mean, who doesn't pack on weight during a cruise? The cruise was a disaster for Matusow in terms of his bet with Forrest. He gained a whopping seven pounds over just seven days, which left him just nine days to lose 15 pounds. That, obviously, is a whole lot harder to do than eight pounds in nineteen days. But he did it. According to Matusow, he didn't eat for five days, did a "master cleanse" (whatever that is), and "spent time in the Jacuzzi". On June 3rd, 2008, Matusow weighed in at a svelte 179 pounds, winning the bet by a full two pounds. Many people at the WSOP remarked that Matusow looked like a walking skeleton, but don't worry - the pounds are quickly coming back on. According to the article in the Times, Matusow conducted the telephone interview while sucking back a 20-piece Chicken McNuggets meal. Erick Lindgren apparently bet Matusow that he wouldn't weigh under 200 pounds by the start of 2009. In Matusow's own words - "Right now, Erick is looking pretty good."